Mr.Robert James Prather III of Cleveland, formerly from Dahlonega, Georgia passed away on Thursday, June 4th, at his residence. He was 50 years old. Robert was born in Fort Ord, California to the late Robert Prather II and Patricia Watts Prather. 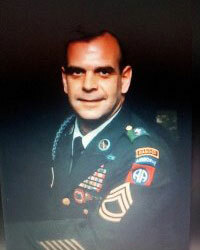 Robert honorably served in the United States Army as a Army Ranger serving in Saudi Arabia and Kuwait as well as many other missions. His outstanding military service earned many distinguished honors including the Bronze Star and the Ranger Tab. Following his retirement from military service Robert began his second career with the Georgia Department of Corrections as an officer at the Lee Arrendale Correctional Facility. Robert is survived by his loving wife of 12 years, Laura Sampson Prather of Cleveland; Sister Kathi Snodgrass of Alta Dena, California; Sister Charlotte Milton of Memphis, Tennessee; As well as sister Stephanie Mosser of Peawauke, Wisconsin. Robert was a true outdoorsman. He love hunting, hiking, and building things with his hands. If he wasn't outside he was doing what he enjoyed the most; spending time with his family.